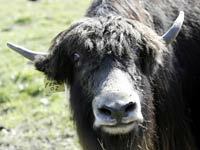 What does a yak look like? 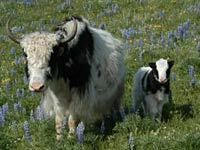 The average male yak can grow to about 2 meters tall, with the female yak being about 1/3 the size of the male yak. 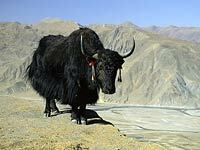 All yak have very long hair to keep them warm. 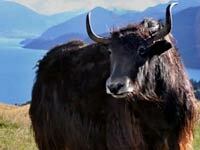 The yak belongs to the same cow family as the Asian water buffalo, the African buffalo and the American bison. 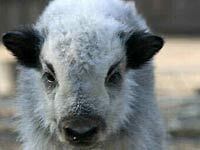 However, the yak is slightly more like the American bison in appearance as both the yak and the bison have long hair in order to withstand the colder climates, the bison of the North American winters and the yak of the mid-Asian mountains. What does a yak eat? Like other species of cow, the yak is a herbivore and spends a great deal of time on grassy plains in the mountains grazing on grasses, herbs and wild flowers. In a similar way to other cow species the yak has more than one stomach which the yak uses to successfully get all of the nutrients out of the plants that it eats. The yak has firm, dense horns which the yak uses to break through snow in order to get the plants that are buried beneath it and the yak will also use it's horns in defence. They have long shaggy hairthat covers their bodies that keep them warm and dry. Download free Yak wallpapers, click on the image to open the large version. Print free Yak coloring pages, click on the image to open the large version.